MI vs DC Head-to-Head Record: Ahead of IPL 2019 Clash, Here Are Match Results of Last 5 Mumbai Indians vs Delhi Capitals Encounters! The clash of Mumbai Indians (MI) with Delhi Capitals (DC) at Mumbai's Wankhede Stadium in Match 3 of VIVO Indian Premier League (IPL) 2019 on March 24, Sunday brings two teams who have experienced quite contrasting fortunes since the inception of the cash-rich league. On a corner of the ring is multiple IPL winner Mumbai Indians who look confident as they approach yet another season with greater optimism. While on the another is a side devoid of success and frustrated with the turn of events have changed its top management and its name. Mumbai Indians and the erstwhile Delhi Daredevils surprisingly have an even record in this fixture. They have met 22 times, with both sides winning 11 games each. Let us look at the last five encounters between Mumbai Indians and Delhi Daredevils to see who holds the edge. Mumbai Indians vs Delhi Capitals Live Cricket Score 3rd T20 Match. Delhi beat Mumbai in front of their cheering home fans by 11 runs thanks to some quality spin bowling by the duo – Sandeep Lamichhane and Amit Mishra. Defending a target of 175, Delhi put a scoring break on Mumbai in their middle overs through some tight bowling and fielding, claiming an 11 runs win in the process. 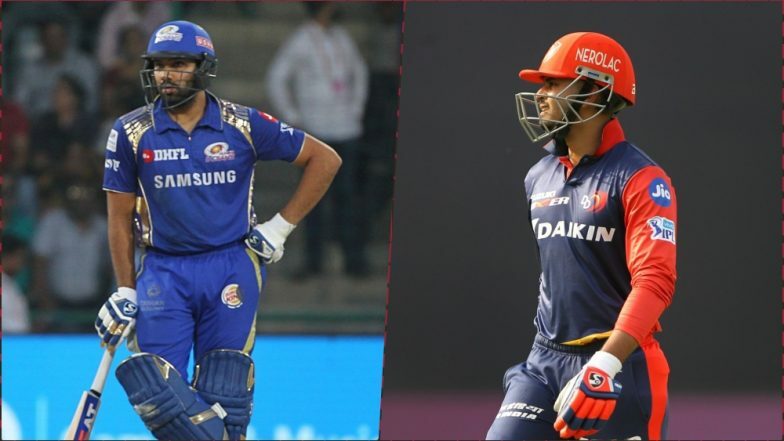 MI vs DC, IPL 2019 Match 2 Key Players: Rohit Sharma to Shreyas Iyer to Shikhar Dhawan, These Cricketers Are to Watch Out for at Wankhede Stadium. In their first meeting of the 2018 season in Mumbai, Mumbai Indians put up a good display with the bat scoring 194 runs. The top three of S Yadav, E Lewis and Ishan Kishan did the bulk of the scoring for the home side, and they were confident of a win. But Englishman Jason Roy had other ideas as his unbeaten 53-ball 91 runs helped Delhi chase down the big score. MI vs DC, IPL 2019 Match 3 Preview: Battle of Equals as Delhi Capitals Take on Mumbai Indians at Wankhede Stadium. In one of the most one-sided games of T20 cricket ever witness, the Mumbai Indians absolutely smashed Delhi Daredevils in their own backyard. Batting first MI put up a staggering 212 on board with Lendl Simmons and Keiron Pollard, the pick amongst the batsman. In reply, the Delhi batting crumbled for just 66 runs to go down by a record 146 runs. The Delhi Daredevils lost out to Mumbai in this game when they really should not thrown in the towel. Scoring 143 runs on a Wankhede pitch is not a tough task and nine out of ten times, the side in pursuit of it should win. But DD folded for 128 to gift their opponent the game. Another Delhi Daredevils batting debacle was on display against Mumbai Indians where they put on 126 in reply to a huge ask of 207 runs needed for a win. Krunal Pandya was the rising star for Mumbai in the game with a 37 ball 86 runs where he showed no mercy on the Delhi bowlers. Delhi managed to beat Mumbai twice last season, but the previous three-game have gone in favour of Mukesh Ambani owned franchisee. Ricky Ponting would be confident his side have the quality needed to mount a real challenge this season particularly against the big boys of the league.